“I genuinely find it hard to find the words to express how good their service was from start to finish ... 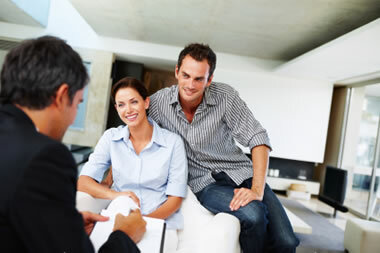 I would be happy to recommend them without reservation to anyone.” Adrian, Guildford. Techfor Energy will discuss your objectives and requirements, either face to face; over the phone or e-mail system, after which, we will be able to present you with an initial estimate without a detailed site survey. If the initial estimate is within acceptable parameters, a detailed site survey can be arranged which will establish the technical information necessary to provide an accurate design and quotation, including estimated system energy production and financial payback details. The site survey will involve access to the electrics and the loft inside the property and taking measurements (for example, taking roof, timber and angle measurements). budget. 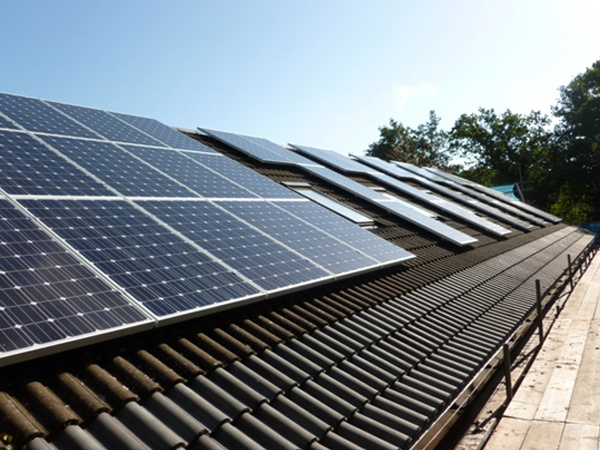 When a quotation is accepted, Techfor Energy will produce a contract and a detailed method statement of how we propose to perform the installation, including access to the roof and other areas of your property. We also advise you of the current lead times for the system ordered. Once the contract has been signed and returned to us with a deposit we will proceed with the ordering of the solar PV system. In accordance with our membership of the consumer protection scheme REAL, the customer has a cooling off period of seven days from placing the order, within which they may cancel the order and receive a full refund of the deposit. We then arrange for any activities that need to be in place before your installation such as scaffolding or ground works. 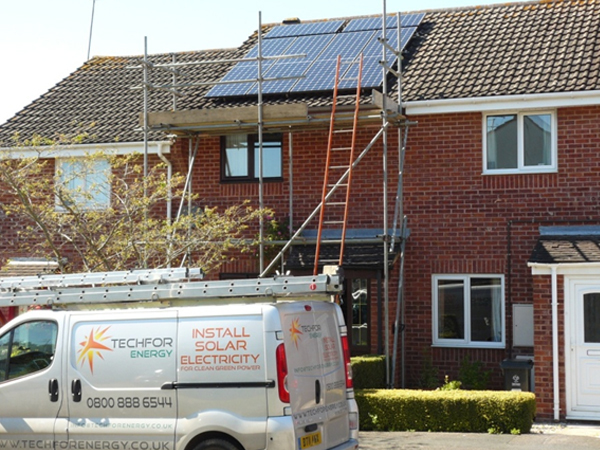 Techfor energy will arrive at your property on the agreed date and perform the installation in accordance with the detailed method statement. 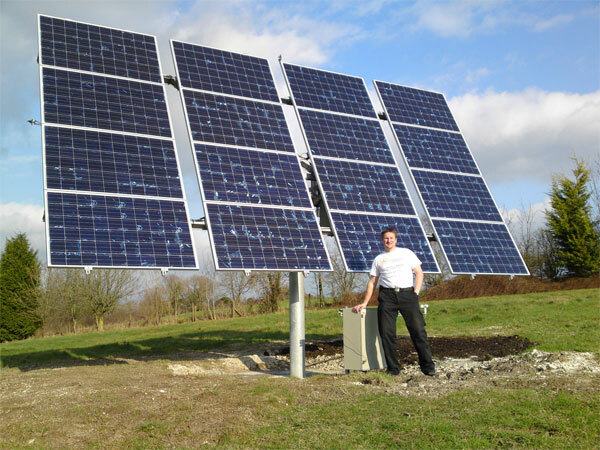 Once the installation is tested and complete, a handover process with the customer is undertaken to ensure that the customer is fully aware of the nature and operation of the solar PV system, including start-up and shutdown procedures. A comprehensive pack of information which contains full details of your system, test and commissioning sheets, circuit diagram, installation and electrical certificates and operating instructions is handed to the customer upon completion of the handover process. Relax and enjoy being paid to produce clean green energy, with the peace of mind of being unaffected by future energy price rises; a 5 year Techfor Energy warranty; 5 year manufacturer warranty and 25 year power production warranty. Extended warranties for parts of the system are available on request & maintenance contracts are also available as an option. Below are some example installations of our previous work. To see more examples of our installations please click here. Energy Prediction 3,442 kWh p.a. 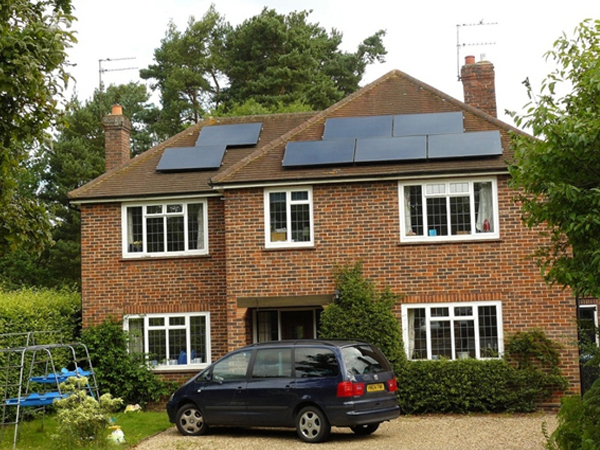 Our customer was looking for the most efficient panel with the best looks to save money on his electricity bills and work with his available roof space. This 3.99 kWp system uses one of the most aesthetically pleasing 300W SunPower all black panels and manages shading by using a SolarEdge inverter. The long warranties of the system and the panel by panel monitoring of the inverter provide high confidence in the longevity of the system and the means of keeping an eye on it. 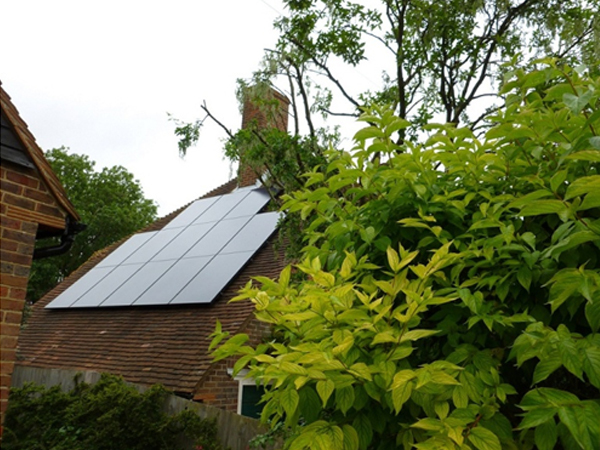 In just over 4 months the system has generated 1,690 kWh and £352.62 FIT tariff earnings. Energy Prediction 6,677 kWh p.a. With a large garage roof and a large electricity bill to reduce, we were able to specify an excellent value panel and design a larger system with a fantastic 5.8 year payback period. This is on track to produce 7,336 kWh in one year. Energy Prediction 32,161 kWh p.a. 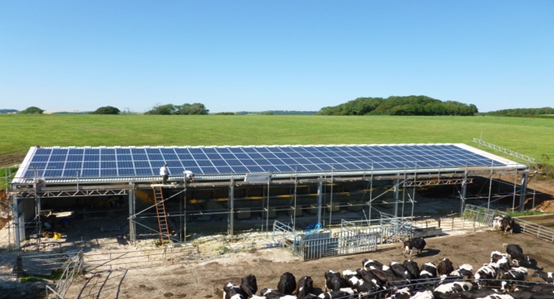 An agricultural installation was designed to maximise production from the dairy roof at the best value. The new dairy will be completed and then brought on-line in parallel with the transition from the old dairy to ensure that there is no disruption to the day to day operations of the business. Energy Prediction 8,257 kWh p.a. 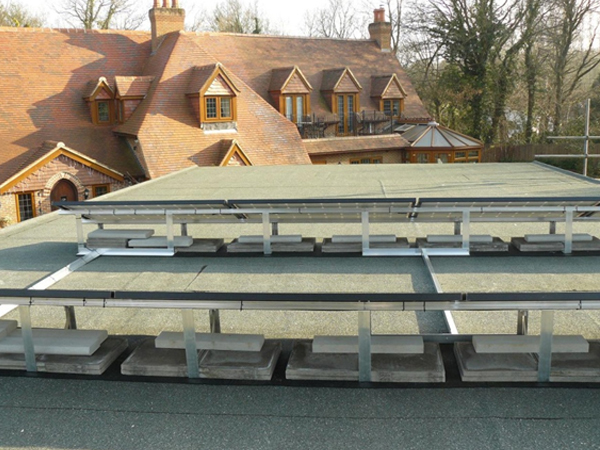 We had designed a suitable PV system for the village hall roof when it started to leak. The owners could not proceed with a PV system whilst the roof was leaking. With several roofing contractors unable to locate the leak and resolve the problem, we diagnosed the root cause of the problem to be insufficient ventilation causing condensation within the insulation between the rafters. A tender process was then initiated to fix the problem and Techfor Energy were selected to re-roof the entire village hall. Whilst the scaffolding was erected, the decision was taken to install the PV system we had designed which manages the on-site shading in a very cost effective way and provides complete fire safety for the children's playgroup with the unique SolarEdge inverter features. Monitoring is also built-in. Energy Prediction 3,300 kWh p.a. The SunPower PV panels on 2 small roof areas provide about 70 % of the annual electricity requirement and the solar thermal system provides about 55 % of the annual hot water requirements for the owner. A SolarEdge inverter manages the different roof angles and provides individual energy management and monitoring for each PV panel. Space has been left around the solar thermal installation to allow for servicing during its life, without disturbing the solar PV system. The 300W all black SunPower panels are the best looking panel on the market and deliver an amazing amount of power out of a small area. These 2 roof areas provide about 40 % of the annual electricity requirement. Another customer who prefers the look of all black panels chose a mid-range Hyundai panel which produces a high amount of energy this time as ample roof space was available. A design with SolarEdge as the inverter of choice was chosen due to the inverter being able to effectively manage the shading from the windows on the roof and also providing a panel by panel monitoring system and maximum energy from the array. 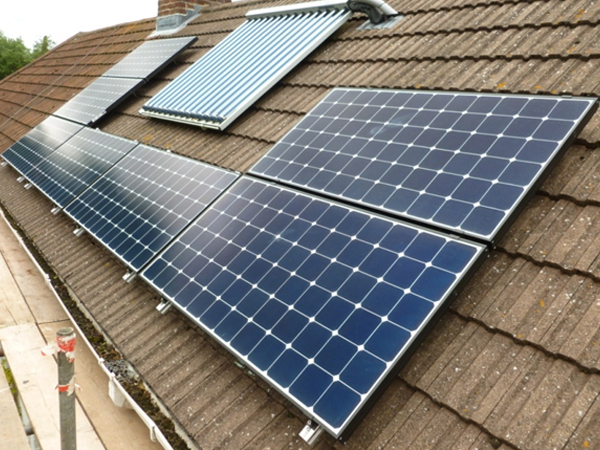 During the design phase, we evaluated using a standard size 250W panel and were only able to achieve a 1.5 kWp size array within the small terraced roof area. 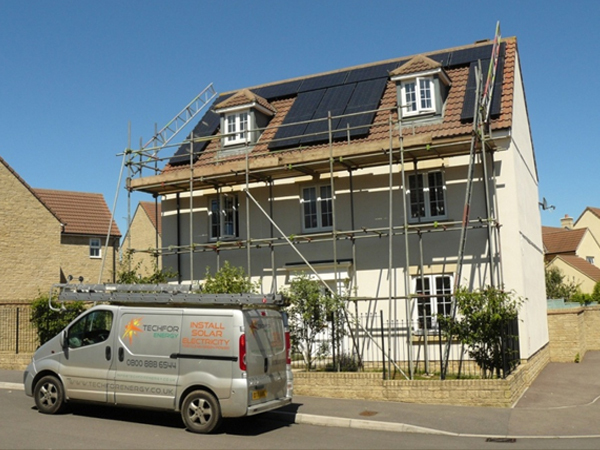 The customer thought that if he was going to install solar PV, he would only want to install it once and therefore it was right for him to do it properly and to use the most efficient panel to maximise production from the available area. 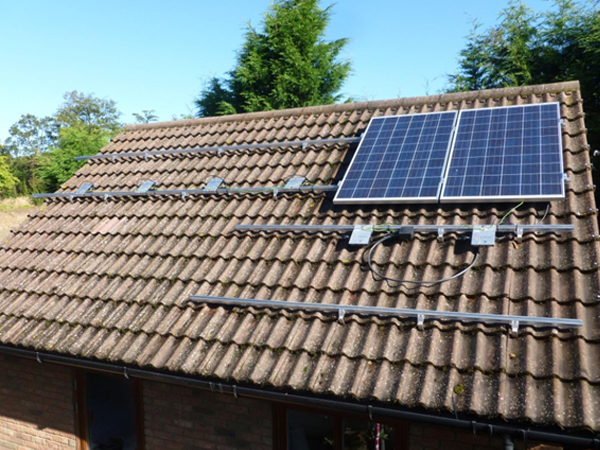 SunPower panels meant he could now achieve 2.45 kWp from the same roof space – a whole kilowatt more power ! With the best 0.1% PV degradation figure on the market and a 25 year product warranty, he is assured of the best production and performance possible for his roof. This flat roof has some shading which needed to be avoided and then managed with traditional string inverter design. The house did not have a suitable unshaded roof, so the flat roof was chosen as the best site. Careful structural calculations were made to ensure that the roof structure could take the amount of ballast required to secure the system during high wind loads. 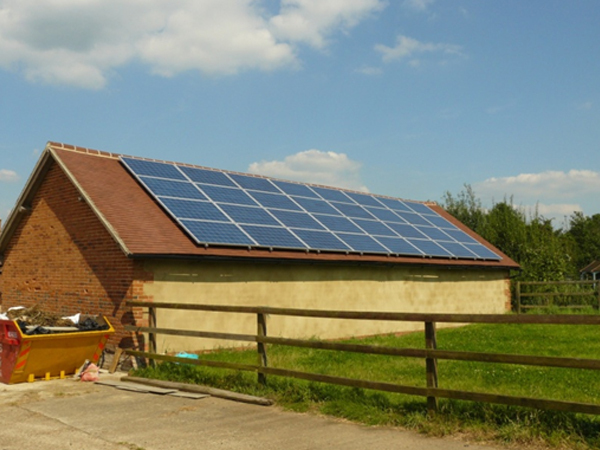 The owner of a rural property had an interest in solar PV and a desire to use the technology but the house did not have a suitable roof area. 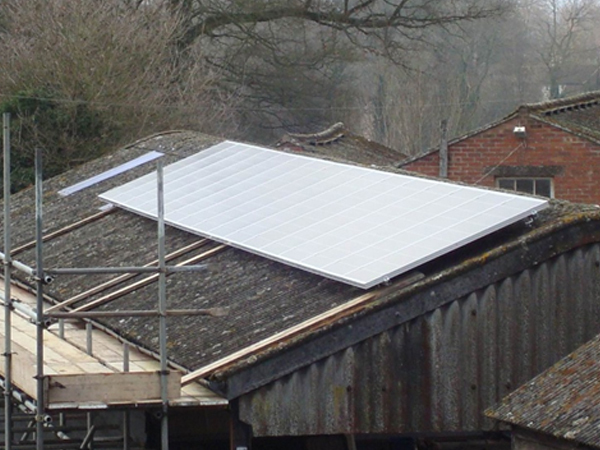 A south facing barn was identified close to the house and was ideal for solar PV. Due to the distance from the sub-station, a capped inverter at 16 Amps was chosen, to avoid the demand that the cable be upgraded for £30,000 for inverters over 16 Amps. An asbestos roof presented no problems to the installation with the right approach and health and safety equipment and procedures. This property was on a hill and very exposed to high wind loads so required a roof mounting system which was engineered to the highest wind loading calculations. Shading also played a factor, so Enphase Micro inverters were chosen as the solution to best manage the shading and generate the highest energy production form two roof areas. With a 25 year warranty and a panel by panel energy production and monitoring system, these inverters are an industry leading solution to many traditional solar PV design problems. This installation follows the sun as it rises and sets throughout the year and always keeps the solar panels at right angles to the sun. This maximises energy production. As this is installed on a hill and very exposed to high wind loads, the system is protected by an anemometer to lay the array horizontal under extreme wind loads. The tracker technology is dynamic and reacts to the changing weather and light conditions. This results in approximately a 40% increase in energy production from the same equipment when compared against an optimally installed static array.